PALM SPRINGS, Calif. — Thanks in part to a strong outing from starting pitcher Nicholas Cuckovich, the Toronto Rush defeated the Coachella Valley Snowbirds, 6-4 on Sunday afternoon at Palm Springs Stadium. Cuckovich allowed two men to reach in the opening frame, but escaped a first-and-third jam by inducing a 4-6-3 double play. Cuckovich would settle in from there, as the right-hander did not allow a run over four innings of work. Toronto got on the board first. The Rush offense combined for six runs in the second and third innings on seven hits and a walk. Peter Pena began the rally by smacking a single to left field in the top of the second. Jon Bannister, Chris Amato, Raul Shah and Ilan Joffe each followed with a single, as Joffe drove in two on a base hit to right field. Leading 2-0, Toronto poured it on in the third. The Rush sent seven men to the plate and pushed four across to extend their lead to 6-0. The Snowbirds made it interesting in the fifth. Four men scored on three walks, a hit-by-pitch and a double to cut the deficit to 6-4. 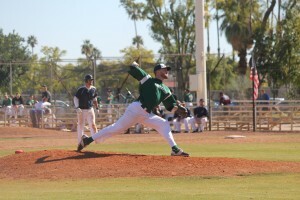 Right-hander Andrew Baxter entered the game with two outs and managed to strike out Masayoshi Akikawa to end the threat. Matthew Dallas entered the contest in the bottom of the seventh and recorded the save after retiring all three men he faced. In game two of Sunday afternoon on the auxiliary field, the Palm Springs Power’s rally fell short against the Oregon Lumberjacks. The Jacks escaped a bases loaded jam in the seventh to narrowly pull out a 6-5 win. Oregon pushed across two runs in the first inning. Connor Arcobasso and Stone Osborne scored on a two-RBI single hit by Christopher Johnson. The Power responded in the third with an RBI double by Dillon Kelley. That would be all for the Palm Springs offense until the seventh. The Jacks, meanwhile, tacked on in the fifth inning. Brett Smith and Chandler Rodriguez reached on errors and eventually scored on a double by Osbourne. Oregon added an insurance run in the top of the seventh inning with an Arcobasso RBI triple. The run proved to be the deciding tally in the contest, as the Power rallied for four runs in their final at-bats, but left the winning run just 90 feet away. Monday, January 29, features the Lumberjacks and Snowbirds on the main field beginning at 10:00am. Game two will begin at 12:30pm, as the Rush will face off against the Palm Springs Chill. Every Monday is “Locals Day” at the California Winter League. Residents with a valid Coachella Valley ID may enter the stadium for just $3. Those who cannot make it to Palm Springs Stadium can listen to the action live on CaliforniaWinterLeague.com.